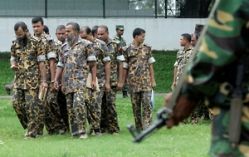 Suspects in the 2009 mutiny by the Bangladesh Rifles border guards (BDR) have been subjected to widespread abuse, torture, and deaths in custody, Human Rights Watch said in a report released today. The mass trials of nearly 6,000 suspects raise serious fair trial concerns. The 57-page report, “'The Fear Never Leaves Me': Torture, Custodial Deaths, and Unfair Trials After the 2009 Mutiny of the Bangladesh Rifles,” provides a detailed account of the mutiny and documents serious abuses in the aftermath, including torture by security forces of people in custody on suspicion of planning the mutiny, and of ongoing concerns about fair trial violations in mass trials of hundreds of suspects at a time. The notorious Rapid Action Battalion (RAB) has allegedly been involved in many of the abuses. “Those responsible for the horrific violence that left 74 dead should be brought to justice, but not with torture and unfair trials,” said Brad Adams , Asia director at Human Rights Watch. “The government's initial response to the mutiny was proportionate and saved lives by refusing army demands to use overwhelming force in a heavily populated area. But since then it has essentially given a green light to the security forces to exact revenge through physical abuse and mass trials.” Human Rights Watch interviewed over 60 people for this report, including family members of the victims, prosecutors, defense lawyers, and journalists. Human Rights Watch called on the Bangladeshi authorities to establish an independent investigative and prosecutorial task force with sufficient expertise, authority, and resources to rigorously investigate and prosecute allegations of human rights abuses after the mutiny. The mass trials should be halted. During the mutiny, 74 people were killed, including 57 army officers, and a number of army wives were allegedly subjected to sexual violence. The mutiny, believed to be triggered by long-standing grievances of the lower-ranking guards, broke out during the BDR's annual celebrations on February 25, 2009, at its central Dhaka headquarters in Pilkhana Barracks. The newly elected government led by Prime Minister Sheikh Hasina chose to negotiate a settlement rather than send in a heavily armed response, as demanded by the army, to quell the mutiny. After the mutiny ended, though, the army and other security agencies immediately began to round up thousands of suspects. Family members of detainees and the media soon reported allegations of torture and custodial deaths. At least 47 suspects have died in custody. Detainees were subjected to beatings, often on the soles of their feet or palms of their hands, and to electric shock. Some victims described being hung upside down from the ceiling. Many of those who survived the torture suffered long-term physical ailments, including kidney failure and partial paralysis. Several family members told Human Rights Watch that the victims seemed psychologically destroyed and depressed as a result. One man whose father died in custody told Human Rights Watch that his father had been in good health until he was arrested: “My father was trying to hide from me what had happened to him, but I could see he had trouble walking, he was almost staggering, couldn't stand.” Human Rights Watch raised these concerns with the government in Dhaka as early as March 2009, and has raised them frequently since. Human Rights Watch knows of no cases in which the government has ordered investigations into custodial torture or deaths related to the mutiny. Instead, official statements have claimed that many of the accused died of heart attacks, or other natural causes, even in cases in which there is substantial evidence of serious bodily harm while the person was in custody. Torture is routinely used by security forces in Bangladesh , even though it is a state party to the United Nations Convention Against Torture. Human Rights Watch and others have long documented the systematic use of torture in Bangladesh by its security forces, including the army, the Rapid Action Battalion, and the Directorate General of Forces Intelligence, the country's main intelligence agency. “The failure of the government to investigate allegations of custodial torture and death makes it appear that it does not care about what happens to victims or about the conduct of government forces,” Adams said. “The government talks a good game about human rights and the rule of law, but it has done nothing to end the culture of abuse and impunity among its security forces.” Human Rights Watch expressed serious concern about the enormous number of people convicted after mass trials before specially created military tribunals and civilian courts. Most of the accused have not had recourse to adequate counsel, adequate time to prepare a defense, access to the evidence against them, or even made aware of the charges. Although the prosecution has assured Human Rights Watch that testimony obtained under duress would not be used against the accused, defense lawyers told Human Rights Watch that such coerced statements were part of their clients' dossiers. Human Rights Watch is particularly concerned that these trials are being conducted en masse, with as many as more than 800 of the accused being tried at once. About 4,000 people have already been found guilty by military tribunals, all in mass trials. A specially appointed civilian court, established under the Bangladesh Criminal Procedure Code, is hearing a case against 847 people accused of serious criminal conduct such as murder. Some of the charges in this case carry the death penalty as a possible sentence. The Bangladeshi authorities should immediately halt mass trials proceedings. Instead, Bangladeshi authorities should establish an independent investigative and prosecutorial task force with sufficient expertise, authority, and resources to rigorously investigate and, where appropriate, prosecute all allegations of unlawful deaths, torture, and mistreatment of suspects in the mutiny, regardless of the rank or institutional affiliation of the person responsible for the abuse. Until such an independent task force is established, existing prosecutors should investigate and, where appropriate, prosecute allegations of unlawful deaths, torture, and mistreatment of mutiny suspects, regardless of the rank or institutional affiliation of the person responsible.